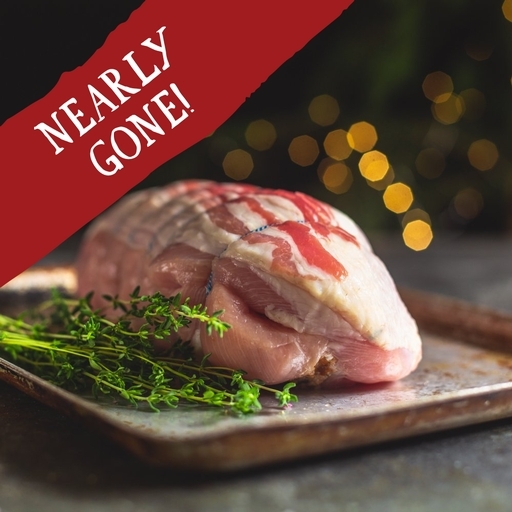 A large organic turkey breast with festive pork, chestnut and apricot stuffing, generously wrapped in bacon. Our slow-reared free-range turkeys have juicy meat that’s full of flavour. Quick to cook, easy to carve, and ideal if you prefer the white meat – this breast joint an excellent alternative to a whole bird. Feeds 4 generously with plenty of leftovers (300g of cooked meat per serving). Place in a roasting tray, brush with melted butter and season lightly. Cook at 180°C/Gas 4 for 65 mins. Make sure the juices run clear; test with a skewer. If the juices are pink, return to the oven for another 5 mins, then test again. Repeat as necessary. Rest in a warm place for 10 mins before serving. Turkey breast (85%), pork and apricot stuffing (Pork (41%) (pork sholder, pork fat), water*, rusk (wheatflour, calcium carbonate*, iron*, nicotinamide*, thiamin*), smoked bacon (pork, salt*, cane sugar, preserative (sodium nitrite*, potassium*)), chestnut, apricot (apricots, rice flour), onion (onion, sunflower oil), salt*, lemon zest, sage, white pepper, nutmeg), bacon (pork, salt*, cane sugar, sodium nitrite*, potassium nitrate*).